I have a new little Instagram feature and it’s a “face of the day” kind of thing, except that I’ve bunged a great big circle of words around my face so that you can see, at a glance, which products I’ve used to create the look. Like it? You can follow me on Instagram here, if you want to catch the pictures when they first come out, but if you don’t want to then fear not! I will always post the same photo here on the website and give a little more detail about the makeup I’ve used. My current hero product has already been mentioned. 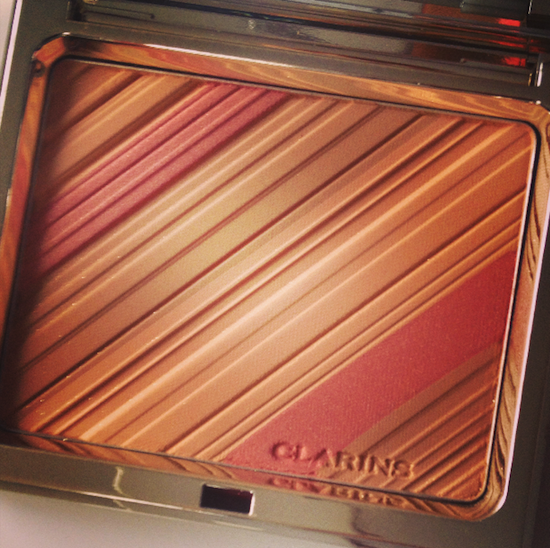 Clarins have done a few of these brilliant face and blush powders now – part pale bronzer, part skin-lifting blush, you can sweep it all over the face or build it up over cheeks and temples for more colour. Don’t be scared off by the tiny ribbon of very sparkly gold that cuts across the palette – it’s decorative and comes off with the first swipe of your powder brush. You can find this little powdery beauty on Escentual here. It’s £24 rather than £31! Now for some very handy primers, both made by Becca. The first is a lip primer and it’s really very different to any other lip primer I’ve tried. It creates a very effective base for lipstick -it almost glues the colour to your lips and it goes some way, too, to blanking out a little of the natural redness that sometimes alters the true colour of your lipstick. I really like it, though I would never wear it alone! It’s not one of those “balms that sit really well beneath your makeup” or whatever – it really is a primer. If you left it without a top coat of something else, it would be a little like applying wallpaper paste and then forgetting to stick the paper to it! 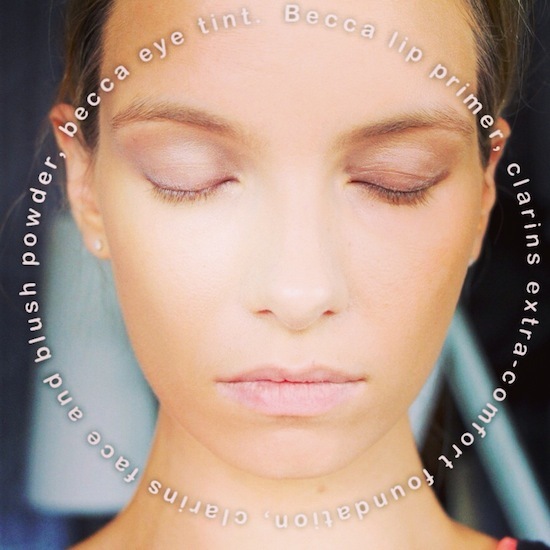 You can find the Lip Priming Perfector at SpaceNK. Great for those who wear bright, vibrant lip colours, not so useful if you’re a swipe-of-tinted-balm kind of girl. 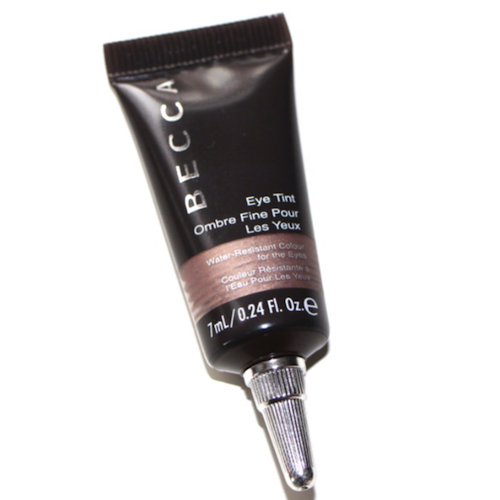 The second Becca product is actually a little tube of cream eye shadow, but I consider it to be a very able primer. (I’ve reviewed it before – you can read my original post on the Vicuna Eye Tint here.) The shade that I’ve used in my look is called Romanticism, but the formula is identical. Smooth and satiny going on and then sets like not many other cream shadows do – creaseless, comfortable but un-budgeable. I should have popped it into my Best Cream Shadows post last week, but it completely slipped my mind. Naughty. You can find the Eye Tint at SpaceNK – it’s £19, which I think might even be cheaper than when I originally reviewed it. At any rate, you need the teensiest bit at a time, so it works out to be pretty good value. I do feel a slight tightening of the lids when I use this, but nothing that bothers me particularly. I love to apply powder shadow over the top – the sheen from the Eye Tint really pushes through and lifts whatever colour you use. Stay tuned for another makeup “look” next week – a finished one, this time!